For this post, we're going to try something slightly different. While the focus is skin and cloth, I don't have much skin on this model so I'm going to look at the cloth and leather on him. I do have some skin tutorials that I'll add some links to for those interested. 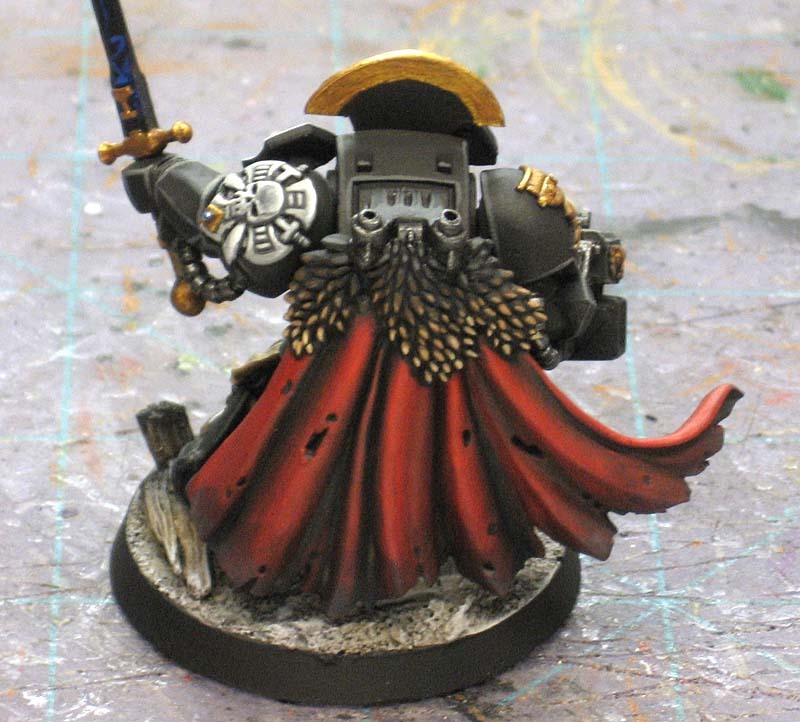 I'm also going to focus more on the cloth and leather with this guy and glance over the other parts of the model. Again, I'm going to paint him by sticking to simple techniques like base coating, washing and highlighting. 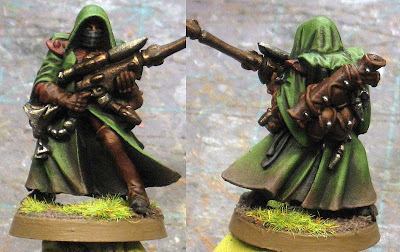 In this case, with a model like this, I would have used wet blending on his cloak in a instant. Since we're not using advanced techniques like that, we're going to stick with some variations on washing to see us through to the end. We start with him primed black. 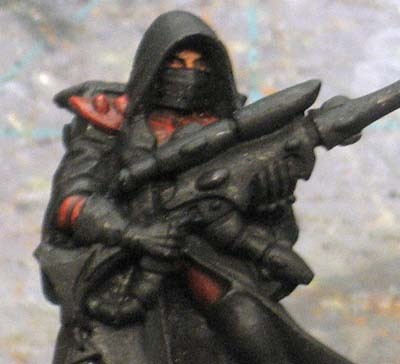 Since I'll be painting him as a Saim-Hann Ranger, I want the dark colors and all the deep shadows. Like we've done so many times before, we start on the "inside and work out." His face is GW Dwarf Flesh with a wash of Ogryn Flesh and then Devlan Mud in the recessed areas only. His armour is GW Foundation Mechrite Red, two washes of GW Thraka Green followed by a was of GW Baal Red and then a quick like highlight of the original Mechrite Red. TRICK: Why did you use the Green to wash the red armour? I did this to mute the red armour without flattening it out like using a black wash might have a tendency to do. It keeps the color much more vibrant in the end. Since red and green are opposites on the color wheel, combining them tends to cancel each other out to some degree and creates a dark color that has some hints of red and some hints of green depending on how your wash is applied. Now the real reason we're here today. 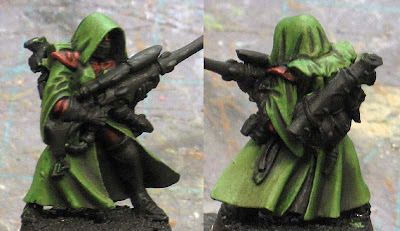 To get this cloak painted. 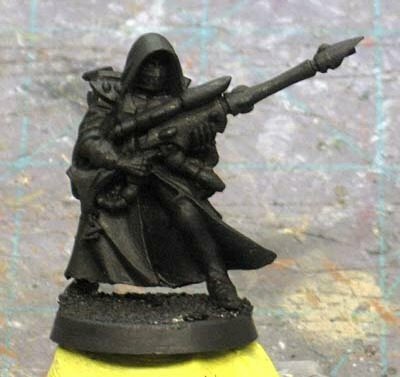 With this model, if I were doing it on my own, I would have wet blended the whole thing in an instant and kept on going. Wouldn't think twice about it. 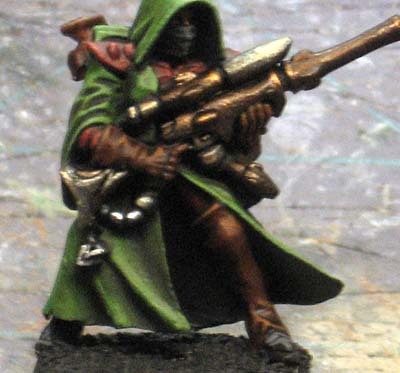 You can see in the example above how wet blending can give you some incredibly smooth blends between your highlights and shadows. You can also get a huge range of value (light to dark) in a very small area. In this example, we go from bright red to black in a matter of a few millimeters. Now that you see the preferred method, forget it. We're not going to use it on our Ranger here. We're going to use a selective wash method. 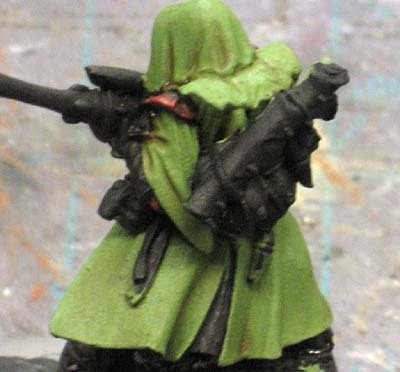 We're going to build up a series of washes on our Ranger to introduce the deep shadows on the cloak without having to wet blend them for a similar look in the end. 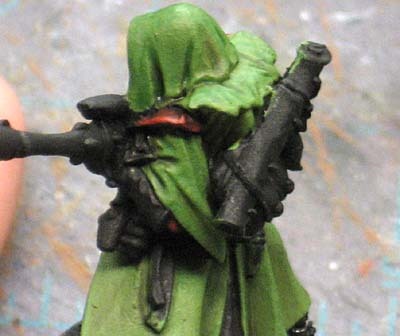 I do have a very simple wet blending tutorial here for those brave souls looking to test the waters with this approach. Again, this one is really basic... I need to do a proper one in the future. 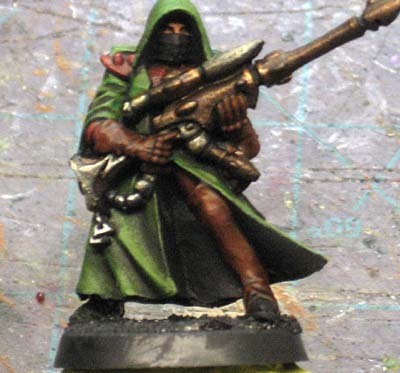 The first thing we do is get ourselves a good base color for our cloak. I went with a light green. A few shades lighter than I wanted the end to be so that it would help create the highlights as I went along adding the shadows. Make sure this is applied nice and clean. After we have our base coat down, we apply a thinned wash of GW Gryphonne Sepia to the whole area. This will be the only wash we apply to the WHOLE cloak. After this, we'll be applying our washes to the recessed areas only. The reason we do this is to help us find all the recessed areas. Some people can see them on the model, others may not be so sure. Doing this will help "map out" where they recessed portions are and give us some direction to follow with all of our remaining washes. Our goal is to have a nicely muted cloak that has highlights and shadows on it when we're done... without having to wet blend this thing. We're going to alternate between washes of GW Thraka Green and GW Devlan Mud until we get the results we want. With this model, I did 2 washes of the green followed by two washes of the Mud and then repeated that process until I had the look I wanted and my shadows were dark enough for my liking. I think that was two more green and two more Mud washes and I had fairly dark shadows in the recessed areas. I can't stress enough that this is not like applying regular washes. This is more like painting with washes instead of paint. We take advantage of the fact that the wash will fade and dry a little bit lighter to help us with the blending into the surrounding areas. 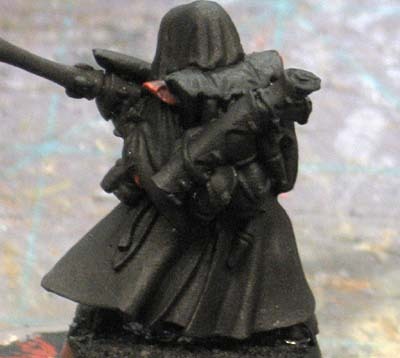 TRICK: Do NOT apply these "shadow" washes to the whole cloak. Doing so will darken the cloak overall and make it harder for us to get the high contrast between the highlights and shadows we're looking for. Just get enough wash on your brush so that you are painting (and it doesn't run or pool up) in the recessed areas only. And here's where I stopped with it. In the end, I went back with my original base color and added some fine line highlights to the upper most sharp edges. This is not needed, but I wanted to see what the effect would be. If you do decide to line highlight the edges, be selective in what you highlight, you don't want to get yourself into a situation where you need to blend the highlight into the surrounding area which is more of an advanced thing. Stick to the very sharp, well defined edges if you're going to go this route. Still keeping to the inside out approach, I finished off the metals at this point. 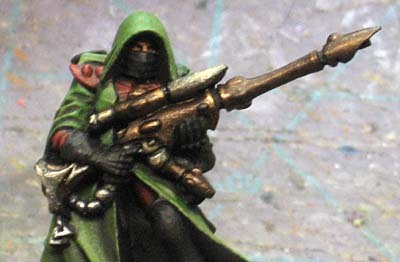 Part GW Tin Bitz and part gunmetal metallic, I painted the gun up real quick. Once dry, the whole got a wash of GW Gryphonne Sepia to tie it together. 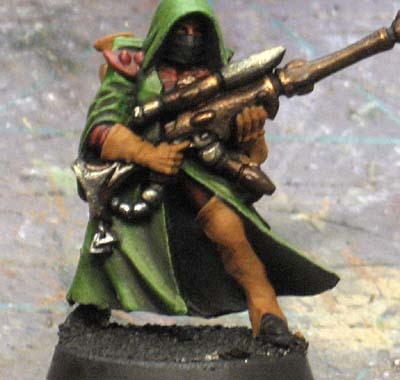 This made the gunmetal color look warm to compliment the Tin Bitz color and look a little more uniform overall. And now onto the other big part of this tutorial, the leather. There are bunch of different ways to paint leather. I have three that I use on a regular basis depending on what final look I want. In this case, I started with a basecoat of Americana Milk Chocolate. It's a fairly rich brown color that's not too dark. We're going to use our washes to darken the whole thing down considerably. Each wash layer will be applied to the WHOLE area. We want to end up with a rich, warm, weathered leather effect. To do this, we're going to use a series of different colored washes. You can see how dark the basecolor has become now that we have our washes in place. The washes used were two passes with GW Devlan Mud, two passes with GW Ogryn Flesh and one last wash with GW Baal Red. Like you can see in the pic above, the whole thing is fairly dark now. To get the highlight on the leather areas, I went in with a warm brown (Americana Sable Brown) and line highlighted the top portions that might catch the light. Not much, just a quick suggestion of a highlight on some of the more pronounced folds in the leather. The reason I used a different brown than the base color is that the base color was very rich and pure. If I used that again on the highlight, it would have made the leather look much cleaner and less war torn. The brown I chose for the highlight is a bit more muted. After you have your highlights in place, give the leather one more wash with the Baal Red to tie everything together. And the finished model. I've gone in and highlighted my black areas (Face mask and boots) with a dark grey and finished off the last of my metallic areas. He's based with a dark brown and some static grass. The weathering along the bottom of his cloak is simple to do. 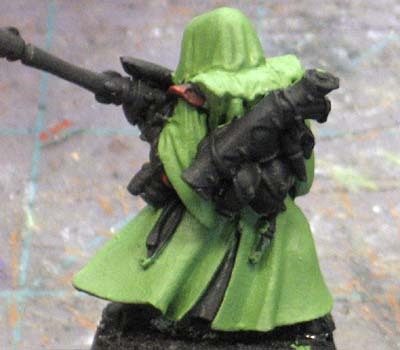 As you are painting you base, take a small amount and drybrush the bottom edge of your cloak. Then repeat the process with the base highlight color just catching the lower most edge this time. It will help give him that weathered look and tie him to his environment. While it might seem like a ton of washing on this model, it goes fairly quick. Since we're not loading it on like we're dipping the model or anything, it all dries fairly quick. Quick enough that by the time you work your way around the model and you get back to where you started, it's already dry. Make sure to check out Dave's model for this week. 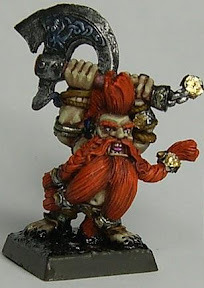 He's taken his Dwarf model and focused on skin and hair. I've got to say, picking the model he did was a brilliant choice too. Thanks for the Tutorial Ron... Also to Dave as well as I hope I can bring some of these ways of painting into what I'm doing as well. BTW Ron is that Terminator a sneak peak at something your working on? I really like what you've done with his cloak - I'm also going to have to try the Thraka Green wash on red sometime. this is a great post and I just wanted to say a big thanks for the whole series. It has gotten me excited about painting again. I'm going to be apply a lot of these techniques to my new Blood Bowl team which, I'm sure, will look much better after these walkthroughs. I look forward to more of this sort of thing in the future. Dave: I was hesitant at first, but could think of no better place to try it than here in this series. Milk_Jester: Your welcome and thanks for the kind words. As for more of this, we'll see. It can be tough to do a series like this above and beyond the usual posting. I would like to try some advanced things though. Raziel: They'll go quick once you get the hang of it. It took me no time at all and I had to stop and photo this guy every few minutes between each step. Flekkzo: For two reasons First, I'm lazy and since each wash layer goes down so quick, I don't want to swap out every 30 seconds between colors. Second was that after two passes with one color, you would start to build up some color to the area and potentially keep it from turning into a mud like nothingness. In some spots it's more green than brown and the opposite is true in other areas. You could adjust this to any combination you want if you liked a certain look. For example, if you wanted more green than brown, you could go 3 passes with Thraka and one pass with Devlan. In the end, you'll find what you like most and that's what I'd say to go with. This model was an attempt to give folks who had no idea where to start a place to start with. Does that help any or not at all? Good luck, I'd love to see how it turns out! All of your tutorials are a GREAT help. Thanks! Anon: Thanks, glad they help! Just discovered your site and I must say it's amazing! Really great tutorials and your Basic series is just perfect for someone getting back into the hobby (used to paint minis quite a lot some 25 years ago and recently decided to pick it up again). Anders: Glad you like it.